Water wells must be located and constructed to provide safe water at all times and under all conditions. The purpose of this publication is to describe approved methods for the construction of large diameter bored wells. Bacterial contamination of a water supply generally occurs when seepage from sewage systems or surface water enters the well. Contamination may enter the well through the top or by seeping through the well walls. Tests have shown that bacterial contamination is usually eliminated after water has filtered through 10 feet of normal soil. Therefore, the well must be constructed to ensure that the top 10 feet of casing is watertight. Proper location of a well reduces the possibility of contamination. A well should be higher than the surrounding ground surface for good drainage. All possible sources of contamination should be at a lower elevation than the well, and the distances to those contamination sources must be in accordance with the Illinois Water Well Construction Code. Surface water should not accumulate within a 15-foot radius of the well. A well should be at least 10 feet from sewers and 50 feet from septic tanks, or 75 feet from sewage seepage fields. As opposed to smaller diameter drilled wells, bored wells are generally constructed at locations where aquifers (water bearing geologic formations) are both shallow and low-yielding. An aquifer that yields only 1 gallon per minute will provide 1,440 gallons per day. Bored wells range in depth from 30 feet to 100 feet. To compensate for low-yielding aquifers, large diameter bored wells serve as storage reservoirs to provide water during periods of high demand. A bored well with a diameter of 3 feet, a total depth of 50 feet and a water depth of 30 feet, contains approximately 1,600 gallons of water. There are two methods approved for the construction of bored wells. 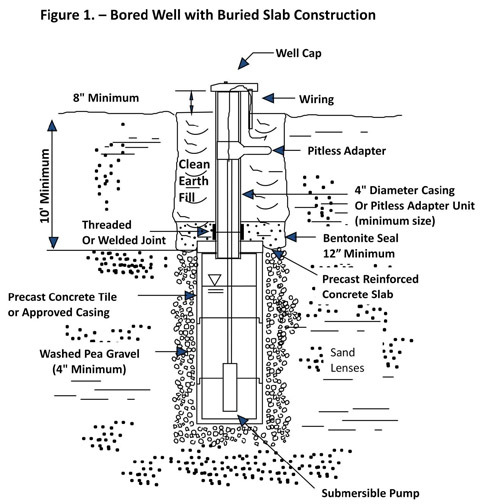 Bored wells are usually constructed using the buried slab method. With this method, the upper well casing shall extend to a depth of 10 feet or more below ground surface and be firmly imbedded in a uniformly tapered hole that is formed when the reinforced concrete buried slab is manufactured, or shall be connected to a pipe cast in the concrete slab. The upper well casing should be at least 4 inches in diameter and extend from the concrete slab to at least 8 inches above the finished ground surface. A bentonite seal that is a minimum of 12 inches in thickness shall be installed over the buried slab the entire diameter of the borehole. The earth fill on top of the buried slab and around the upper well casing shall be compacted and mounded to cause surface water to drain away from the well. Sand or gravel shall not be used as fill on top of the buried slab. The lower concrete casing is normally constructed using precast concrete sections ranging in diameter from 2 feet to 3 feet. The diameter of the well bore hole below the buried slab must be at least 4 inches greater than the outer diameter of the well casing, and the annular space (opening between concrete casing and well bore) must be filled with pea gravel to the well bottom. The discharge pipe exits the well below grade through an approved pitless well adapter. A pitless well adapter is a mechanical device attached to the well casing pipe, usually below frost level, that permits water to pass through the wall of the casing and provides protection to the well and water from contamination. An approved vented well cap or seal shall be properly installed on top of the well casing. As an alternative, the discharge pipe can exit at the top of the well casing through an approved well seal. If the pump is located away from the well, the buried pipe leading to the pump from the well must be encased in a pressure discharge line at system pressure. 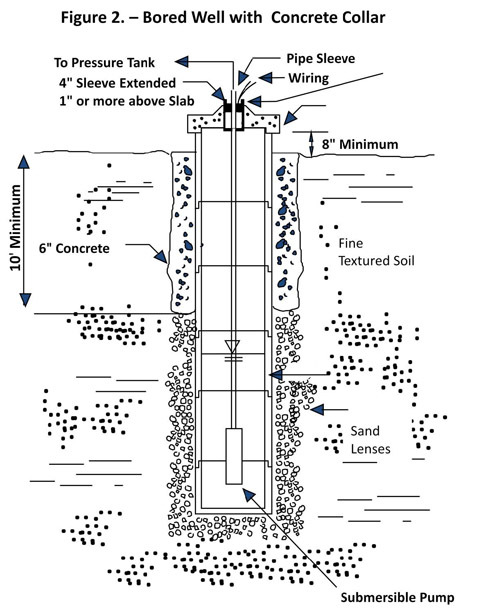 For bored wells not finished with a buried slab, the concrete casing also ranges in diameter from 2 feet to 3 feet. The annular space between the excavation and the installed casing should be grouted with concrete that is at least 6 inches thick and poured without construction joints from a minimum of 10 feet below ground level to the ground surface. The diameter of the well bore hole below the grouting must be at least 4 inches greater than the outside diameter of the well casing and the annular space shall be filled with pea gravel to the well bottom. The casing shall extend at least 8 inches above the finished ground surface. The cover slab must be at least 4 inches thick, without joints, adequately reinforced and with a diameter sufficient to extend to the outer edge of the casing. Adequate sized pipe sleeve(s) shall be cast in place in the slab to accommodate the type of pump or pump piping proposed for the well. A watertight joint must be made where the slab rests on the well casing. If a manhole is installed, it should consist of a curb cast in the slab and extend 4 inches above the slab. A watertight cover must be provided over the manhole and should overhang the curb at least 2 inches. The discharge pipe must exit the well in a watertight manner at the top of the well casing through an approved well seal. A new, cleaned or repaired well normally contains bacterial contamination that could be present for weeks unless the well is thoroughly disinfected. This can be accomplished by the use of ordinary liquid laundry bleach (unscented) in a solution concentration of 100 parts per million (ppm) of chlorine. The amount of bleach required is determined by the amount of water in the well. Three cups of laundry bleach (5.25% chlorine) are required for each 100 gallons of water. One cup equals 8 ounces, 2 cups equal 1 pint, and 4 cups equal 1 quart. When working with chlorine bleach, you should always be in an open or well-ventilated place. Do not allow bleach to remain in contact with the skin or clothing. Solutions are best handled in plastic containers since strong chlorine solutions corrode metal containers. Determine the well diameter and the number of feet of water in your well. From the diameter listed in the table above, use the number in the adjacent column to determine the cups of liquid laundry bleach to use per foot of water. Multiply the cups of liquid laundry bleach times the number of feet of water. For example, to disinfect a water well that is 3 feet in diameter with 10 feet of water requires 15 cups (10 ft. x 1.5 cups/ft.) or about 1 gallon of liquid laundry bleach. Add the required amount of liquid laundry bleach to 10 gallons of water and stir thoroughly. Pour the entire amount of this solution into the top of the well. While pouring, splash the solution around the casing or inside of the well, being certain that the solution has contacted all parts of the well. Connect one or more hoses from faucets on the discharge side of the pressure tank to the top of the well casing and start the pump, recirculating the water back into the well until a strong chlorine odor is detected. Then open each faucet in the system until a chlorine smell is noticeable. Close all faucets. Rinse chlorine solution off any wires and the pitless adapter in well casing. Seal the top of the well. Let stand for several hours, preferably overnight. After you have let the water stand, operate the pump, discharging water from all outlets until all chlorine odor disappears. Adjust the flow of water from the faucets or fixtures that discharge into septic tank systems to a low flow to avoid overloading the disposal system. After the chlorine odor has disappeared, let the water run a few more minutes, then collect a sample of the water and submit it to a laboratory for analysis. To obtain bacterial and nitrate analyses of drinking water, submit well samples to a laboratory certified for coliform bacteria testing by the Illinois Department of Public Health, and certified for nitrate testing by the Illinois Environmental Protection Agency. More detailed information can be found in the Illinois Water Well Construction Code, available on the Internet at http://www.ilga.gov/commission/jcar/admincode/077/07700920sections.html. A hard copy can be obtained from your local health department or from one of the regional offices listed below.